)'( THE ROAD TO BURNING MAN )'( ---> A series of shows in August dedicated to artists who will be playing at Burning Man this year! 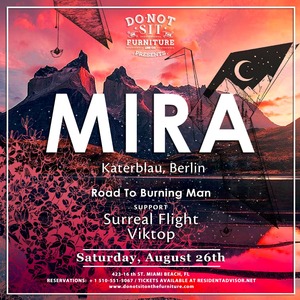 In this series on Saturday, August 26th, we welcome back our good friendMira [URSL / Katermukke]| www.facebook.com/Mira.Artist| soundcloud.com/mira_katerSupport by:Surreal FlightViktopEven though being the latest discovery of the Bar25 Musician Crowd, Mira is by no means a newcomer. Hailing from Halle, Germany, she has enthused her front row followers with her expressive melodic and minimalistic house sets for already more than a decade.